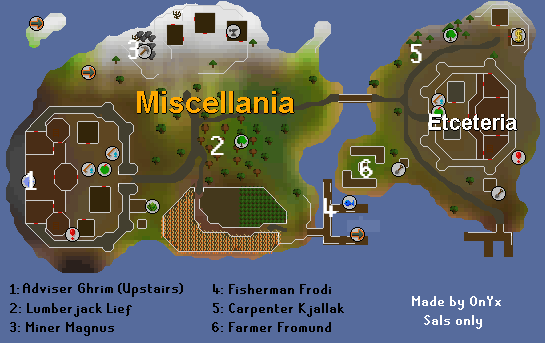 After completing the Throne of Miscellania Quest, you have the option of taking part in the Managing Miscellania Activity. 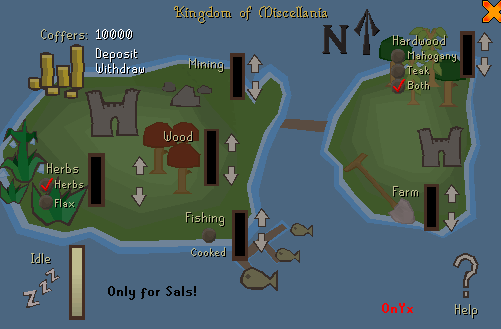 This game allows you to invest some money in the city of Miscellania (and later, Etceteria) in exchange for receiving various supplies such as fish or lumber. It is strongly recommended that you do Royal Trouble, because it increases your coffers capacity — and the cash your subjects receive as payment — from 50,000gp a day to 75,000gp. This results in more resources being gathered for you. Herbs - excluding Guam, Tarromin, Snapdragon, Torstol and Toadflax. Swordfish and Tuna - you can choose whether to have the fish cooked, or kept raw. Note: You can choose to gather both Mahogany and Teak by simply choosing "Both". It is recommended that you have over 750,000gp in the coffers. This way you can leave your workers as they collect for you and you don't have to worry about topping it up all the time. Also, if you have your Lunar Magic open, you can use the "Contact NPC" Spell and talk to Adviser Ghrim when ever you want. You may notice that this is a very good way to make money. There a multiple skills that can get trained from collecting certain things. Example: If you collect Maple Logs, you can train either Fletching or Firemaking. If you collect Tuna and Swordfish you can train Cooking or any other combat skill. This means you have to set the fish to be "Uncooked." You get to pay your servants money to get a source. And you don't have to do anything else! Everything is discounted! If you don't want to pay 180gp each for Coal, then get your own little miner to get them for less! 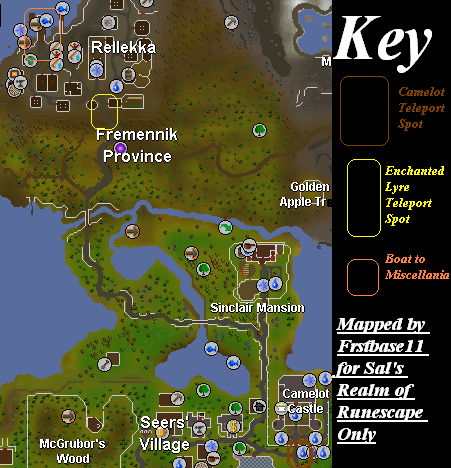 To start this you need to go to Miscellania which is an island north of the Fremennik Province. 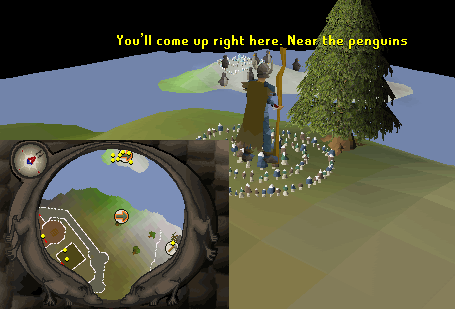 Talk to the sailor there and he will ask if you want to go to Miscellania. Say yes and off you go! Or if you have finished (or started) Fairy Tale Part Two, you can use the Fairy Rings and enter "CIP" as a code and be brought north of the castle with Adviser Ghrim and King Vargas. If you ask him: "How is my kingdom faring?" He will say if your subjects are working or not. Then he will show you your Approval Rate. Note: The number depends on the time you take to help out your subjects. He will then tell you the progress of your subjects, if they've collected anything and if they have he will ask if you would like to collect the earnings. After you have selected, this map will come up. This is the progress map. Here you can choose what sources you want the people to collect. After he is finished he will give you a book that looks exactly like the Book of Balance. Don't get too excited, it's not. In this book it will explain to you what to do and how to do it. If you where wondering how to find everyone, then this map will clear everything up. The Approval rate is very important in Managing Miscellania. The higher that rate, the less money your subjects will take. To get your Approval rate higher, the only thing you need to do is help them with their jobs. Example: Cutting Maple logs with Lumberjack Leif will raise your rate 0.5% per log. It doesn't sound like much, but you lose 1% each day so it isn't that hard to keep it high. If you want to know your rating with the people, go to Adviser Ghrim and ask "How is my Kingdom faring?" Coffers are what your subjects take as money. In other words, it's basically gold pieces. 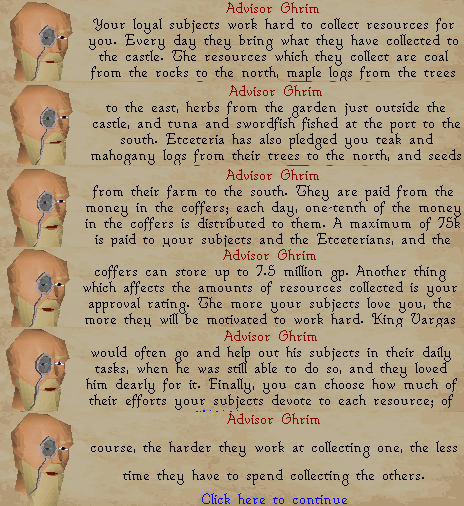 After you finish Throne of Miscellania you get 10,000 coffers put in as a deposit. After you finish Royal Trouble you get 20,000 gold as a reward. You can either bank it and use it for personal uses, or put it in as Coffers so your subjects keep getting paid. You can deposit as much as 5,000,000 coins after you finish Throne of Miscellania. After completion of Royal Trouble, you can deposit as much as 7,500,000 coins. The chapter will explain to you what you will get if you choose to gather something with 100% of your resources. You may find that you will get extra things when you are collecting something. This is usually about 1 item per 100. 100 Maples gives 1 birds nest. 100 Coal gives 1 gem. 350 Teak gives 1 bird nest. 350 Mahogany gives 1 bird nest. 100 Herbs give 1 Herb Seed. Now what you've all have been waiting for. This section will tell you how much you can get each day if you have your gatherings on 100%. Herbs: This is the best price you can put on Herbs because they range from Tarromin to Kwuarm. Farming cannot be priced due to all the different seeds you can get. From the Bird Nests you may get either Rings, Seeds or a Bird's Egg. About 70% of Nests contain Seeds, 27% contain Rings, and the rest contain either Red, Green or Blue Eggs. See the table below to find out the percentages for each different item you may get from a Nest.